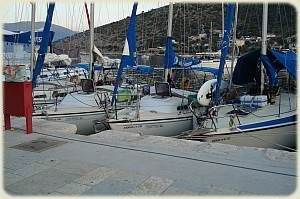 Learn to Sail in the Greek Islands. It's as easy as falling off a boat. Coming from a long line of landlubbers how could we learn to sail? Blimey Mrs S even gets seasick in a pedalo!. However in the Greek Islands everything is different and that is where it happened. We love having beach holidays in the Greek Islands but often, as we were roasting ourselves on the beach, we thought that it might be a good idea to have a more active sort of holiday. Walking? Too hot in Summer. One of the many sights are the various yachts lazily cruising around the blue waters. So we must go on a sailing holiday. 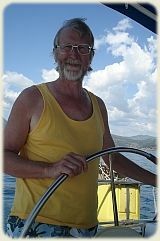 The trouble was that the only experience of sailing any of us had was a ride in a dinghy about 40 years ago. So we had to learn about sailing. On one of our excursions around Paxos we visited Lakka and in the harbour there was an organized flotilla of yachts with a company called Sailing Holidays. We chatted to one of the crew and they said how easy it was and that almost no experience was needed. That's what we are going to do! We so enjoyed ourselves that we decided to do it again but possibly after gaining a bit more experience and perhaps taking our daughter and her husband to be along as extra crew. This is where our friends and their yacht, Selkie Dancer, come in. 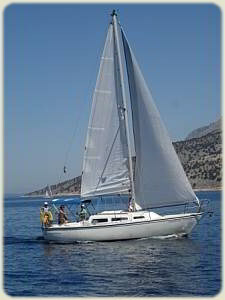 They are in the process of sailing from their home in Scotland, around the Mediterranean and who knows where. We managed to catch a ride while they were around Majorca and then again in Corfu. It was great fun and we at last really did learn to sail (well a bit anyway) with them.